Mange and viral diseases have a substantial, recurring impact on the health and size of reintroduced wolf packs living in Yellowstone National Park, according to ecologists. Following the restoration of gray wolves to Yellowstone in 1996, researchers collected blood from the animals to monitor parasite-induced disease and death. They also tracked the wolves in each pack to follow their survival and allow additional data-gathering. "Many invasive species flourish because they lack their native predators and pathogens, but in Yellowstone we restored a native predator to an ecosystem that had other canids present that were capable of sustaining a lot of infections in their absence," said Emily S. Almberg, graduate student in ecology, Penn State. "It's not terribly surprising that we were able to witness and confirm that there was a relatively short window in which the reintroduced wolves stayed disease-free." The researchers found that within a year after the wolves were reintroduced to Yellowstone, 100 percent of the wolves tested had at least one infection, but mange did not infect wolves living in the park until 2007. "We can look at the biology of the diseases and predict which ones will come in first," said Peter J. Hudson, Willaman Professor of Biology and director of the Huck Institutes of the Life Sciences, Penn State. "What was surprising was that so many diseases came in so fast, but those were the ones we expected to come in first. It wasn't really a sequence, they were almost there immediately. That's very interesting in itself. " The diseases that infected the wolves quickly were all viral, including canine distemper and canine parvovirus—both contractible through bodily secretions. Mange, however, is a skin infection, caused by scabies mites, that makes the wolves scratch and lose fur. An infected wolf can lose enough body heat in the winter to freeze to death. Mange is spread by direct contact with another mite-infected animal or by contact with the mites themselves, as they can survive away from a host for several days, depending on the temperature. "Where did those diseases come from?" asked Hudson. "Most of them initially came from other canid species, like coyotes or foxes. Wolves are animals that disperse far and move around fast, and once the wolves were established the diseases were spread from pack to pack." Almberg and Hudson tracked how quickly mange spread from pack to pack after the disease entered the population. The number of infected wolves in a pack did not affect the likelihood of a neighboring pack to contract mange, but distance was a factor—for every six miles of distance between an infected pack and an uninfected pack, there was a 66 percent drop in risk for the uninfected pack. Some wolves and packs were not severely affected by mange, while other packs were decimated, the researchers report in the current issue of Philosophical Transactions of the Royal Society B. In January 2007, Mollie's pack was the first in Yellowstone to show signs of mange infection. As of March 2011, they had recovered. The Druid pack, which had been one of the most stable and visible packs in the park, according to Almberg, started to show signs of mange in August 2009. "It was in a very short amount of time that the majority of the animals [in Druid] became severely infected," Almberg said. "The majority of their hair was missing from their bodies and it hit them right in the middle of winter. The summer before it got really bad, we saw that many of the pups had mange." The Druid pack was gone by the end of the winter in 2010. The researchers note that the wolf population in Yellowstone experienced several phases—from 1995 to 2003 the wolves experienced rapid growth, from 2003 to 2007 the number of wolves stabilized, and the most recent data from 2007 to 2010 shows a decline. 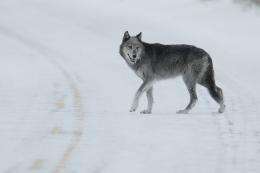 "We're down to extremely low levels of wolves right now, we're down to [similar numbers as] the early years of reintroduction," said Almberg. "So it doesn't look like it's going to be as large and as a stable a population as was maybe initially thought." Also working on this research were Paul C. Cross, disease ecologist, Northern Rocky Mountain Science Center; Andrew P. Dobson, professor of ecology and evolutionary biology, Princeton University; and Douglas W. Smith, director, Yellowstone Wolf Project.